Dental Crowns Protect Teeth, Improve Smiles. If your dentist recommends a crown for one of your teeth, it might be hard to believe you really need one. Chances are, like most people who need a crown, you aren’t experiencing any pain. And that’s a great thing. If you wait until you feel pain, you could need more than a simple crown to address the problem. Dental crowns repair, protect and strengthen teeth. A crown fits over a tooth, just like a cap. Once cemented, it fully covers the tooth at the gum. There are many reasons why you might need a crown. If you’ve had a root canal, getting a crown is the final step to help you keep your natural tooth intact. You could also need a crown if one of your teeth has so much decay, a filling wouldn’t make sense. Big fillings can weaken teeth. Sometimes you need a crown because you have tiny stress fractures on a tooth. A lot of people get these, myself included, from grinding their teeth at night. If this is happening, you’ll need a crown and a biteguard to prevent further damage to the rest of your teeth. From my own personal experience with grinding and cracked teeth, I can say that crowns are an effective way to protect your teeth. Dental crowns can improve your smile. With today’s dental techniques and superior materials, we can make natural-looking crowns that match the rest of your teeth. You might need a crown to protect or strengthen a tooth but it can also improve your smile. We can use crowns to cover discolored or misshaped teeth. For most of my patients, we make crowns out of material called zirconia. This material is a lot stronger than the old porcelain type of crown. It can last 10 years or longer if you brush and floss around it. Temporary and final dental crowns require two appointments. Getting a crown is a pretty routine dental procedure. However, it does takes two appointments because we use a dental lab to create the final crown. The first appointment lasts about two hours. It entails many small steps. I always tell my patients – don’t worry, you’re not going to have your mouth open the entire time. During this appointment, we take two impressions of the tooth – one for a temporary crown and another for the final crown. We also drill the tooth down on all sides so we can create enough room to fit a temporary crown. It’s a pretty boring appointment but it can be noisy. It’s a good idea to bring headphones and something to listen to while you wait. When you leave the first appointment with your temporary crown, make sure to avoid chewing anything hard or sticky, like gummies or chewing gum. Your second appointment is two or three weeks later when the dental lab finishes creating your crown. It takes about 45 minutes to place the final crown. You should give your final crown at least an hour before you try to chew anything. After that, you can eat whatever you want. Don’t wait to get a crown if you need one. One of the reasons you always want to see your dentist regularly is because we can detect problems before they start causing pain. 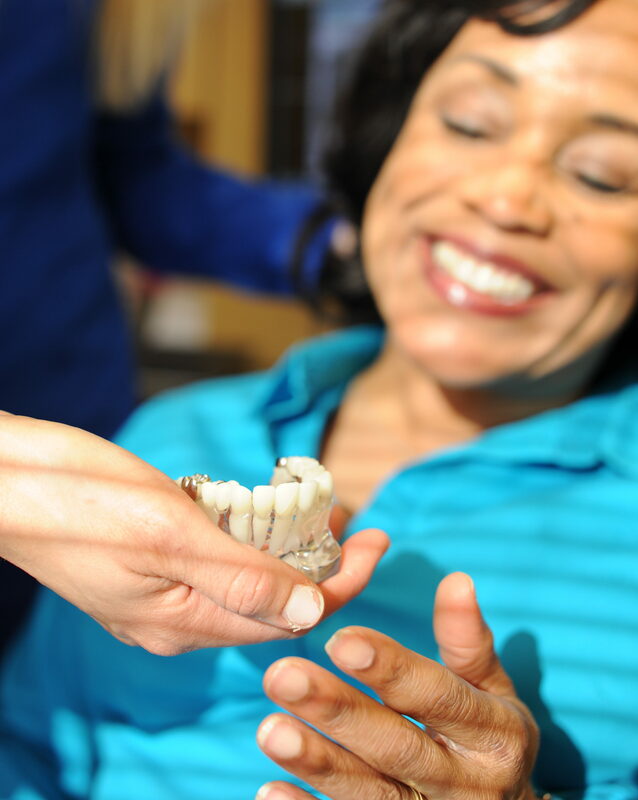 If your dentist recommends getting a crown, it’s best not to wait – even if you have no pain. If you put off getting a crown, you could end up needing a root canal or an extraction. Dr. Carolyn Norton sees patients at Konikoff Dentistry’s Harbor View location in Suffolk, Va. Request an appointment online or call (757) 606-1450.